The all-day event, co-hosted by LifeTree Media and Pink Velvet Couch, took place at the Best Western Plus Chateau Granville in downtown Vancouver on Tuesday, March 6. 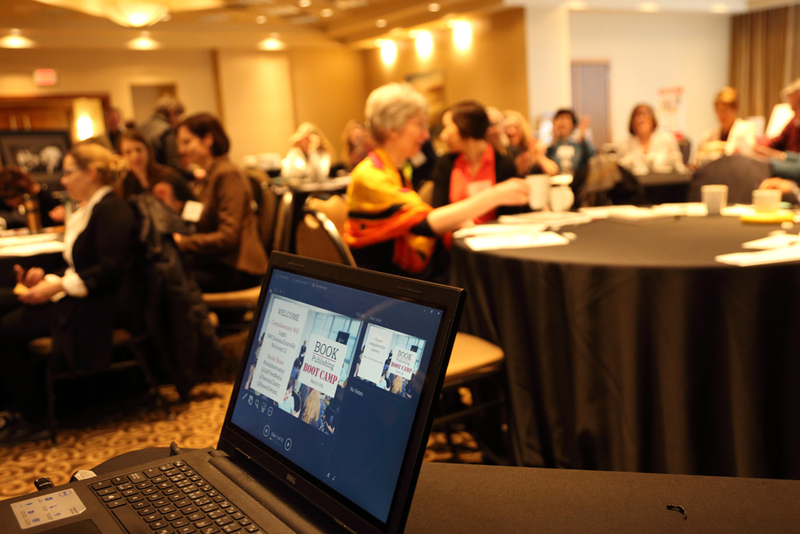 It was a packed day of informative presentations, interactive workshops, and stimulating panel discussions with award-winning publishing experts and published authors. In the morning, our attendees showed up, ready to mingle with fellow aspiring authors and a cup of coffee in hand. Our event organizer, Pamela Chatry, officially kicked things off with a warm welcome and an introduction to our Publisher, Maggie Langrick. Maggie delivered a rousing presentation on the publishing landscape, covering the three models of publishing: traditional, hybrid, and self publishing. Our first panel, “The Business of Publishing,” featured Nancy Flight, Editor Emerita of Greystone Books; Robert Mackwood, Principal Agent of Seventh Avenue Literary Agency; and Megan Williams, Senior Manager of The Self Publishing Agency. They shed light on book proposals, royalty advances, and building a strong publishing team. On our second panel, “Modern Book Marketing,” Zoe Grams of ZG Communications, Lindsay Nahmiache of Jive PR + Digital, and our Publisher, Maggie Langrick, explained the importance of starting early when marketing your book and the real costs of running a book launch campaign. Next, Charmaine Hammond—co-founder of Raise a Dream and one of our event partners—gave an engaging presentation on sponsorship. A published author herself, she shared valuable tips on how authors can fund their books by nurturing relationships with local organizations. It was our first time co-hosting a publishing event, one that we found to be an amazing and worthwhile occasion. In addition to our speakers, we’d like to thank our terrific sponsors for their support: Romantique Lingerie, Perfect Impression, Janice Porter, Linwood House, West Coast Editorial Associates, Photoart by Simpson, Jive PR, and Raise a Dream. We’d also like to extend our appreciation to our event organization committee: Pamela Chatry (Pink Velvet Couch), Charmaine Hammond (Raise a Dream), and Megan Stacey (Megan Stacey Communications). Lastly, we are truly appreciative of our wonderful attendees—we wouldn’t be surprised if a few of you showed up as a speaker at the next Book Publishing Boot Camp! Missed the Book Publishing Boot Camp? Check out #BookBootCamp on Twitter for event highlights. If you’re an entrepreneur with a book idea, sign up for our concept development services to get your book plan ready in as little as six weeks.